Quite a while since I heard your name. Often thought of dropping you a line, but had no idea what has become of you, or where you were. Gunilda (my wife) and I were in Marblehead for a few hours a couple of years ago. The old town looked pretty much the same -- the New Fountain Inn, the park, the big brick chimney alongside the Burgess yard -- all the familiar landmarks brought back quite a flood of memories. It was hard to believe nearly forty years had passed. I am still a pilot, though I find it costs too much and takes too much time to fly very often. One war in the Air Service (if that's what they called it then) -- turned down for another one -- maybe they'll change their minds and take me back for the third. Now retired from the Wall Street racket, but manage to keep plenty busy. Why don't you join the EBs? "The most exclusive club in the world", and getting more so every year as the black bordered list grows longer. It doesn't get you much, but it does serve to keep alive the memory of those who died to give men wings. And I like to see an airline captain's eyes bug out when I explain what the little gold pin means. Let me hear from you some time. JOHN F. GRAY -- A PROFILE John F. Gray of Del Mar, California, first soloed on July 24, 1912 at Marblehead, Mass. He started flying instruction with the Burgess and Curtis Company in Florida, in February, 1912, and later moved to Marblehead. After four and one half hours of dual instruction, he combined his solo with his license tests and was awarded F.A.I. Certificate #150, just as his contracted five hours of flight at $100 per hour ran out. He became a test pilot for Prowse in Hopkinsville, Kentucky, for a brief period and then gravitated to Meniola, Long Island. There he found that being a birdman was a poor way to make a living, so he tried aviation writing for Aero and Hydro magazine and others, which did not prove to be any better. The First World War found him in the Aviation Section of the U.S. Signal Corps, instructing on Jennies. In 1938 he took out a C.A.A. Private License which he kept active for about twenty years. He was an investment counsel, specializing in aviation industries, until his recent retirement. He was presented with a bronze plaque in San Diego, commemorating the fiftieth anniversary of his first solo flight. I just came in from my daily walk on the shores of Nahant Massachusetts. On my way in I found a dog tag that appears to be from WWII. 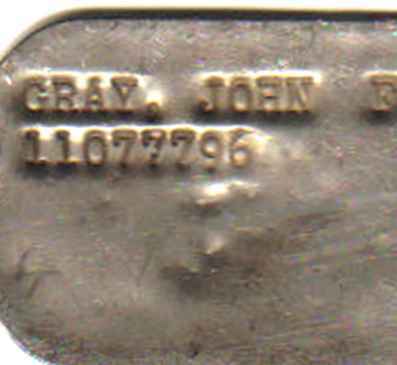 The name reads John F. Gray there is an 8 digit # and the letters A P. I found his name on your website as an early aviator who lived in Marblehead which is just down the road from Nahant. I,m hoping maybe you can give me some more info about him so I can find out if I have his dog tag. Editor's Note: If you can help Lauren and me to solve this mystery, please contact me. Thank you.